Elegance is an important term in art, design, and interiors. It can describe many things, but by definition it is a word that describes something notable in its expression – it is something beautiful and refined, something that holds a special essence – a presence that often defies explanation, but just is. In our living spaces there was a time when an elegant living room and dining room was of upmost importance. Having sophisticated rooms to gather for conversation, holidays, and meals (typically minus a TV) was central to creating beautiful interiors. Elegance was sought after, something to be attained for its value, beauty, and the pleasure of the experience. However, in these settings, elegance also seemed to conjure certain impressions – unapproachable, stuffy, formal, lacking comfort. As our modern world has transitioned to a place of relaxed, casual comfort – the concept of a separate living room and dining room has become somewhat obsolete and the formality of this type of living is disappearing. 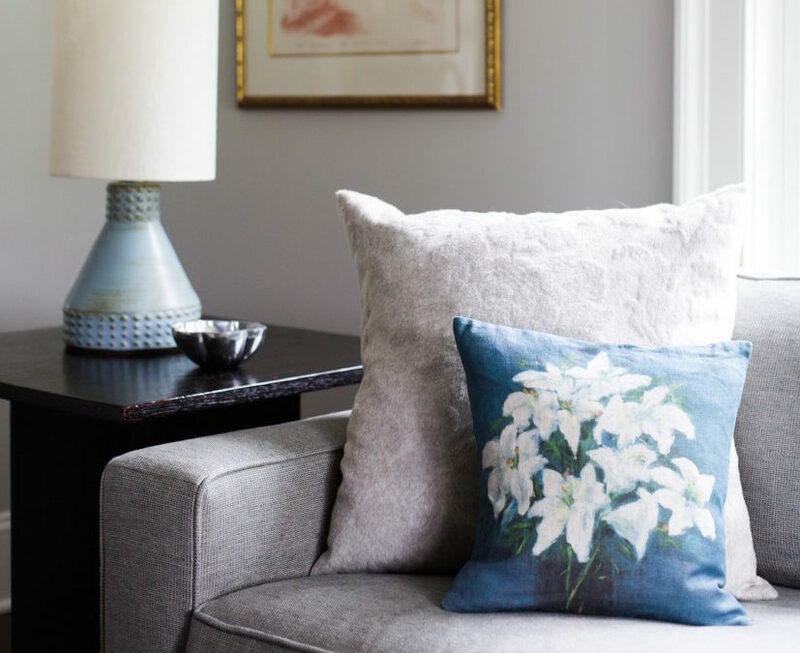 Will elegance then too become obsolete or is it possible for a fresh interpretation of elegance to evolve and find a place within our casual living spaces. 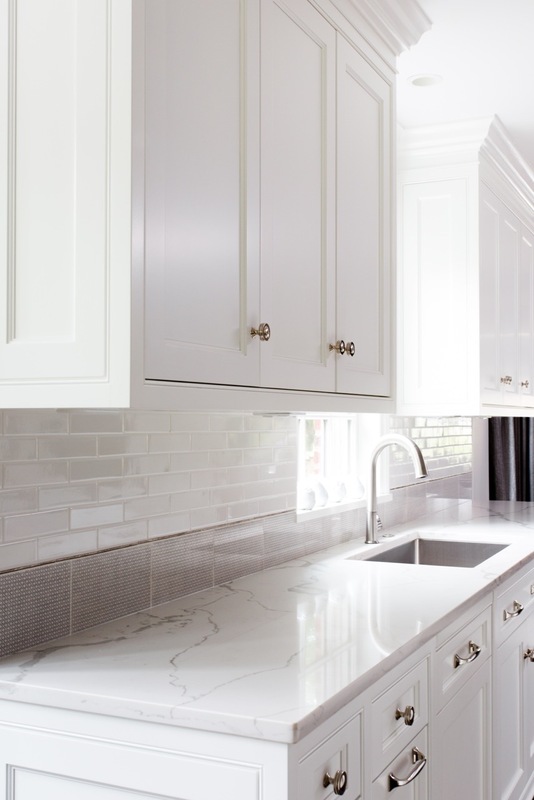 As we favor open floor plans with big screen televisions that take center stage and dining that may be centered around the kitchen island or casually set alongside TV viewing, I believe the idea of elegance becomes even more important. It is the design element that brings beauty, harmony, and balance. Elegance is not ordinary. It is something that endures. It is something exceptional that brings pleasure to an experience – whether that experience is formal or casual. Today our living spaces are multi-functional and we ask them to do many things in our daily lives. 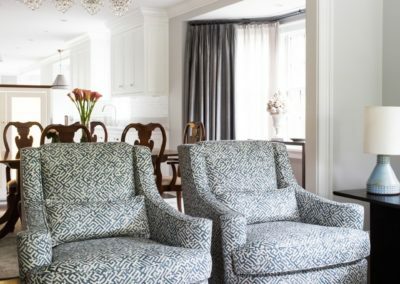 Within these new types of spaces, perhaps we can view the place of elegance through a different lens – so that it seamlessly coexists in our more relaxed, casual, comfortable interiors – so that our homes become a place of casual elegance. 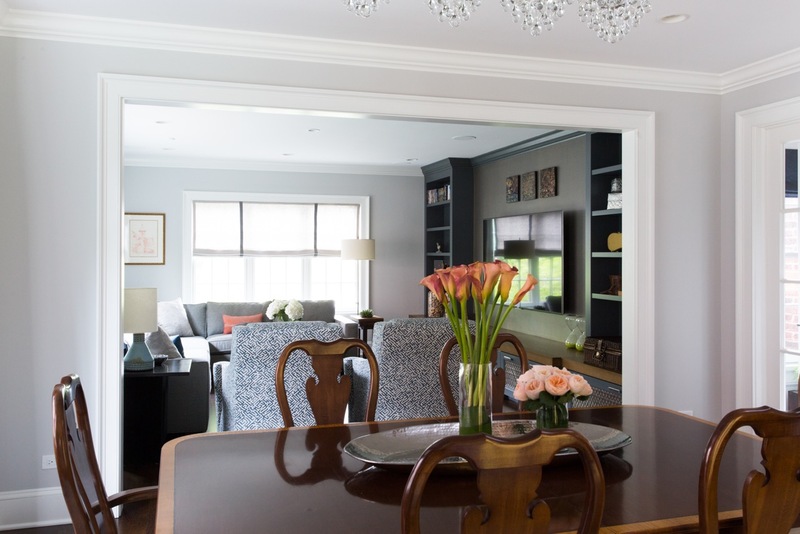 The Home…..Embrace Elegance and Enjoy. 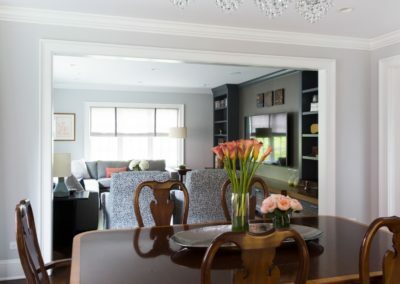 A central dining area sits comfortably between the kitchen and family room. Elegant ceiling crystals anchor the space and draperies in Fortuny’s beautiful cotton act as a subtle frame for the dining area. 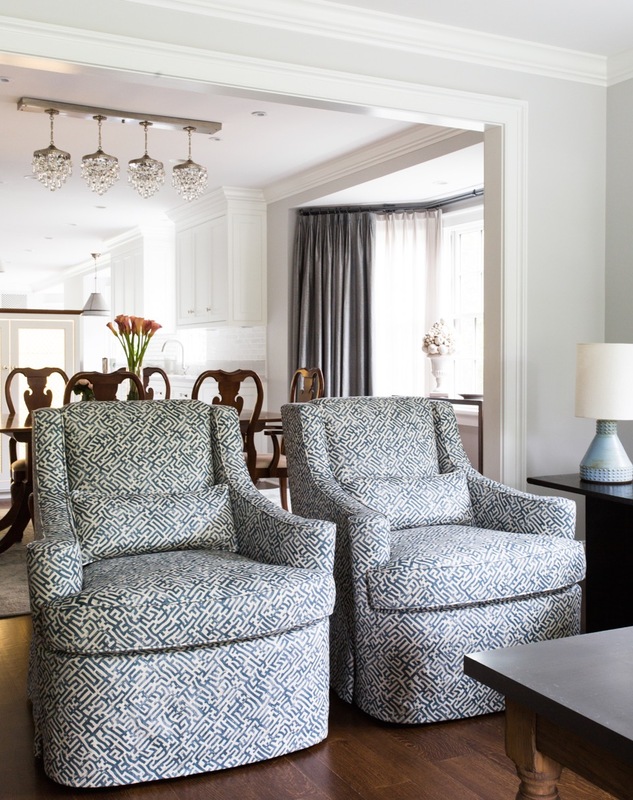 The lively fretwork pattern of the family room chairs act as a delicate screen divider between the dining area and family room. The open space allows for conversation, TV viewing and dining - relaxed and comfortable for all occasions. 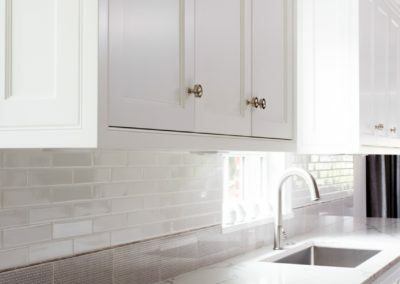 An all white kitchen with a simple subway tile splash is elevated with a subtle metal liner and single row of delicately etched marble in a rich taupe to highlight the beautiful veining of the countertop.